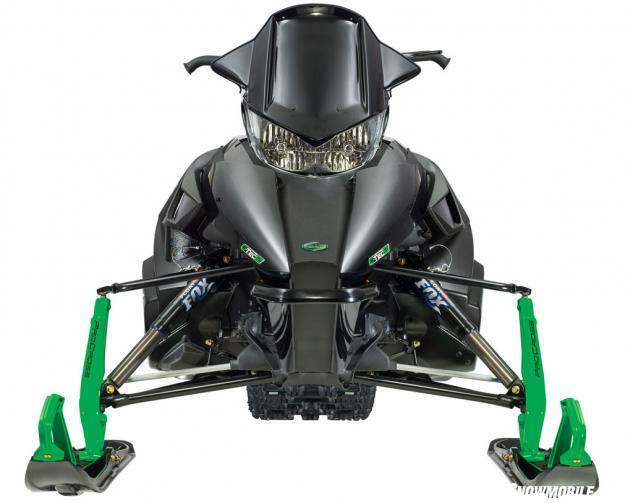 If we had won the recent half-billion dollar lottery, we could buy any assemblage of Arctic Cat snowmobiles we wanted. We didn’t win, although a Minnesota man, who lives near our U.S. editorial offices, did win. And he’s a snowmobiler, one who can ride out of his garage to access the state’s 20,000-plus miles of groomed trails. Maybe there’s a new sled in his future? Currently he rides older IFS-equipped Polaris Indys, but if he sought our advice, we might tune him into the 2014 Arctic Cat El Tigre! Cat’s new “600-class” entry retains the two-stroke performance heritage of the El Tigre predecessors. Based on a sneak preview of the born-again El Tigre and a test ride in West Yellowstone this past March, we’ll admit to having a soft spot for this latest iteration of the historic El Tigre. 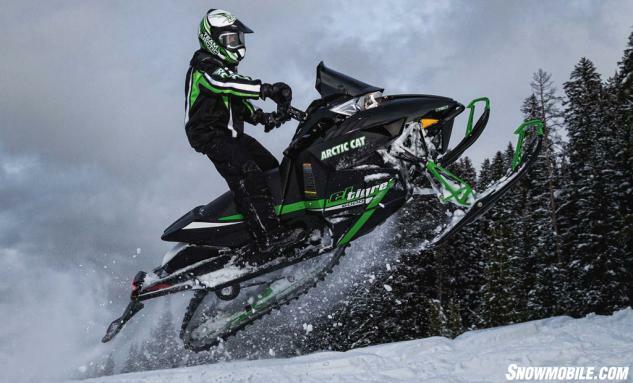 Admittedly, our test ride came at altitude and it did affect the brand new Arctic Cat designed, engineered and manufactured 6000 C-TEC2 direct injection engine. Sea level operation in the flatlands of Minnesota should be another matter as the more than 6,000 feet of western altitude goes away. When Arctic Cat showcased the El Tigre in a January preview at its manufacturing facility in St. Cloud, Minn., the sled seemed almost overshadowed by news of the company’s collaboration with Yamaha and the new Genesis power for the ZR7000 series. Heck, all of a sudden Arctic Cat for 2014 grew engines. A bit naively we figured that Suzuki power might vanish altogether, but for 2014 it remains strong as ever, just redesignated in the engine line up of one-liter four-strokes – turbo and non-turbo – fan-cooled and liquid-cooled two-strokes. Added in is the one-liter Yamaha four-stroke triple for the ZR7000 models and the all-new 599cc C-TEC2 twin for the El Tigre. There is quite a collection of power options for 2014 Cat sleds. 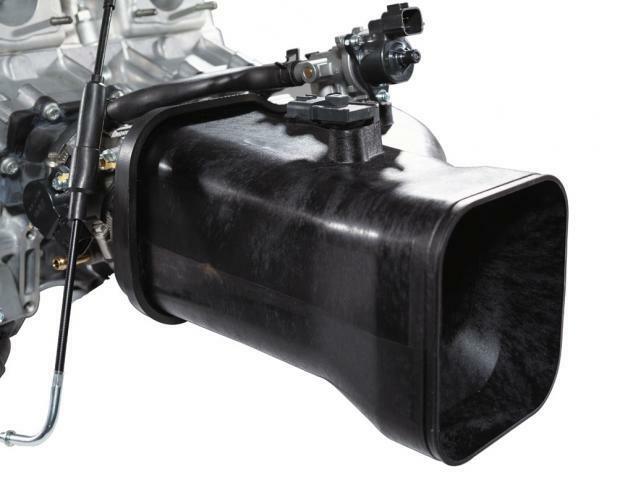 Intake for the direct-injected C-TEC2 two-stroke features dual 47mm stacks. Performance-wise the El Tigre should be close to the Yamaha-powered ZR7000 models. Arctic Cat’s official power claims give the Yamaha triple a 10-horsepower advantage over the new two-stroke 600. That being said, we expect that the actual horsepower and power-to-weight differentials will be close – or “feel” close – between the El Tigre and ZR7000. But, even if the chassis and base equipment is similar, there is more than a US$1000 price difference between the Cat-engined sled and a Yamaha-powered one. Truthfully, if you can wrangle a test ride before making a purchase, do it. Based on our seat-of-the-pants impressions in Yellowstone, Arctic Cat engineers did a terrific job in getting the Yamaha-equipped ZR7000 models to act darn close to what we want in a two-stroker. The four-stroke throttle response was quick and dead-on responsive. 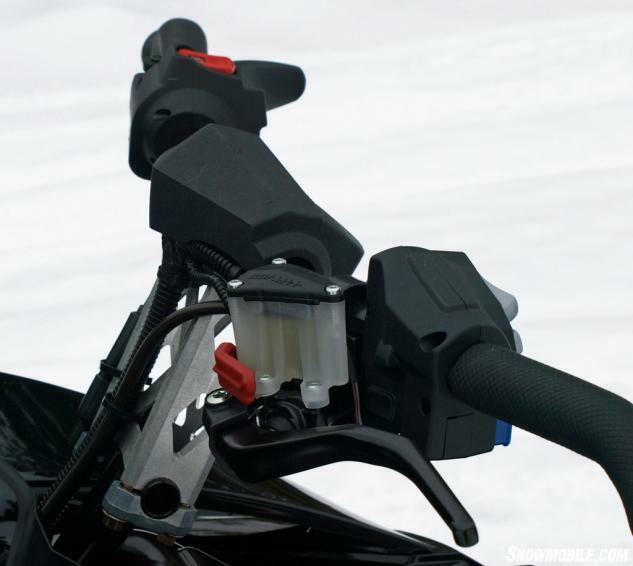 That extra weight of the four-stroke triple that has plagued Yamaha’s own sleds enough that the company added electronic power steering to give riders a lighter “feel” is a non-factor in the ZR7000. In our estimation you have to choose between a really responsive, fun to ride four-stroke Cat or a lighter weight, two-stroke responsive, direct injection Cat. As two-stroke loyalists, we like the El Tigre. But, we also came away from our ZR7000 test rides extremely impressed with how well Cat engineers got those models to handle, ride and interact with the trail. Built on the ProCross chassis, the 2014 El Tigre flies true and easy. If we accept that the new Cat two-stroke twin churns out the same 125 horsepower as Suzuki’s 1056cc four-stroke twin, we would not take a second look at a ZR5000 model. The reaction of the two-cycle engine ranks way above the response of the older four-stroke, which Arctic Cat passed off as its “600 class” trail engine. Of course, it did. Cat had to sell what it had and the direct-injection twin wouldn’t come on line until 2014. What would you do? What will you do in making a choice in favor of the El Tigre? Here’s a personal dilemma we have. We really like the El Tigre. Our impartiality stems from positive history with a long ago Kawasaki-engined 440cc El Tigre that we rode along the wilderness of lakes, rivers and forest that separates Minnesota and Ontario. You can’t do that now, but it was legal when we did it. This overhead view shows off the integrated rider area that includes a tapered saddle, handlebar positioning and open floorboards that are wide for your boots and designed to readily evacuate snow. The El Tigre has been to Arctic Cat what the SRX has been to Yamaha or the Blizzard to Ski-Doo. It’s significant to the company’s heritage, but if you don’t wallow in sappy history, you’ll find that your decision between a two-stroke El Tigre and a four-stroke ZR comes down to performance and dollars. Take away the power options and you’ll find that virtually all “ZR” models share a great deal in common. The ProCross chassis enjoys three seasons of serious refinement. Same can be said of that tall-spindled Arctic Race Suspension. Cat engineers broke new ground and have been evolving it ever since. The distinctive tall spindles work with Fox Float shocks for up to 10-inches of bump control. The Slide-Action rear suspension works. It’s relatively simple when compared to the latest Polaris and Ski-Doo multi-action designs with their multiple things to turn, adjust and tune. The slide-action uses long spring arms, adjuster blocks and shocks in a set up that is less complicated to tune, but remains active and consistent when transferring energy from front to rear during acceleration. Frankly, we’ve asked Arctic Cat engineers why they don’t fit more adjustments and gimmickry to their rear suspension. They acknowledge that some consumers ask about changes, but Cat designers feel that the Slide-Action offers better all around ride and handling while offering a suspension that is easy to adjust and keep in tune. One thing we always sense after we’ve had a discussion with a group of Arctic Cat factory engineers and designers is that they’ve not only already thought about what we’d asked about, but most likely had tried it and either dismissed it or had it in testing. Guess that’s another way of saying that these Cat people remain serious about snowmobiling. After all, when it comes to snowmobiling, young engineers learn fast that keeping up with the head engineer in the ditches around the Thief River Falls, Minn. factory ain’t easy! 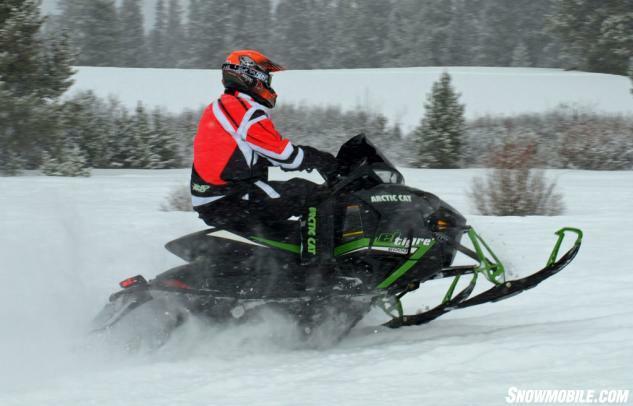 That’s why sleds like the El Tigre and its all-new 6000 C-TEC2 two-stroke work as well as they do. Cat’s curved bars make rider/sled interaction intuitive. As for us, we like our conveniences and would opt for the El Tigre ES, which adds electric start. Overall we really enjoyed our time riding the 2014 El Tigre, especially since the cockpit and seating arrangement have to rank as one of the best we’ve ever straddled. Cat gets an “A” for getting the rider into the action – whether it’s blasting berms or casually cruising to the trail head. But, like we said, we have an affinity for two-strokes and that El Tigre heritage. We know where our lottery winnings would be invested.